Home Keluarga & Wanita Kenapa Kahwin Awal? People ask me, why did I marry early (kahwin awal) ? At first, I myself didn’t realise its early. Look at my brothers and sister, they marry young too. Babah lagi dahsyat, kahwin umur 21 tahun while Ummi was 19 years old at that time – 30 years ago. You may think about the different of culture now and back then, but surely there can’t be any double standard imposed by my parents, he he. But, when friends keep asking me – kenapa kahwin awal? – I really ponder upon myself. Adakah saya terlampau awal untuk kahwin? How do you know it’s early? For me, awal bermaksud belum sampai masa. If you come to the class just on time, you don’t call it ‘awal’. You call it ‘tepat pada masanya’. Bertanya tentang ‘kahwin awal’, it is indirectly a question of readiness. Let me ask you something, how will you know when you come to certain age, you’re ready? I admit that experience comes with time, but mark my words. Untuk berkahwin, the better way is bukan dengan berkata ‘Saya plan untuk kahwin pada umur 26 tahun’ but rather say ‘Saya plan untuk kahwin dengan such characteristics’. Its not about set masa, its about set diri dan personaliti. Kita kena bezakan antara dua perkara; ‘bersedia’ dan ‘membuat persediaan’. In Islam, everyone who can make love (If you don’t understand what I mean, you’re not ready to marry yet. Period) is considered bersedia. Yes, the benchmark is just Ba’ah. Some scholars may interpret it – apart of making love – as mampu memberi nafkah, mahar etc, but all of them agree that the basic meaning of Ba’ah is simply you can make love with your spouse. So, if you think (errr, you should sound more confident) you can make love, you’re ready. That’s the minimum requirement. So, is there anyone out there dare to say that he is not ready yet? He he. As we won’t enter exam hall with minimum preparation, we shouldn’t enter marriage life with minimum preparation too. Here comes the ‘membuat persediaan’ part. Persediaan apa yang ingin dilakukan? Untuk perkara ini, saya akan beritahu secara ringkas sahaja, the rest you have to do it yourself. Because membuat persediaan is really need an implementation. Pertama, persediaan agama. Ilmu agama sangat penting, terutama kerana suami perlu menjadi imam solat dan imam keluarga. I don’t know why, sejauh mana teruk pun seseorang tu, selalu dia berharap untuk mendapat pasangan yang soleh atau solehah. Walaubagaimana pun, berbanding ilmu, I prefer to say that persediaan agama should be more focus on akhlak. Akhlak mulia akan membantu banyak perkara untuk sama-sama membina taman syurga. What can I say is joining usrah is a great bonus for this part. Kedua, persediaan rupa. Let’s be honest, kita semua nak yang sedap mata memandang. As it’s subjective, we don’t have to worry. Allah itu Maha Adil, yang perlu kita lakukan ialah mengambil berat tentang pakaian dan kebersihan, wangian dan kesihatan. Ketiga, persediaan harta. Nak bagi anak orang makan pasir? Itu klise. Kita hidup dalam dunia realiti, perlu duit untuk hidup. Usahakan harta yang halal dan baik. Sambil jangan lupa untuk bina sifat qanaah iaitu berasa cukup. Agar indah turut dinikmati ketika waktu susah. Keempat, persediaan keturunan. Respect yourself. Jangan buat something yang boleh affect keturunan. Simply don’t smoke, it’s bad for your health, your wife, your baby, and your baby’s baby. Selalu saya jumpa kawan yang sudah minat terhadap seseorang dan ada keinginan untuk kahwin, tetapi tak kahwin-kahwin jugak. They always gave me many good excuses – nak ada rumah dulu la, nak ada kereta dulu la, nak ada job dulu la. For me, the very moment you consider too many things, it partially shows that you’re ready to jump into marriage life. Kan kita selalu dengar, orang dah kahwin ni selalu consider banyak perkara. See, you just don’t realise that you also have that married people character when you consider banyak sangat perkara sebelum kahwin. And, thats good. Positive. So, just married. Besides, first step is always the hardest part. Ye la, paling susah nak bangun subuh bukannya sangat sebab air sejuk pun, tapi sebab selimut tu yang berat. Ouch. So what I always do is this ‘I will take this very first step, and then I commit’. You just need some push. Irony, people nowadays is okay with couple but not okay with kahwin awal. Do you know why? Sebabnya kita takut untuk beri komitmen yang besar. 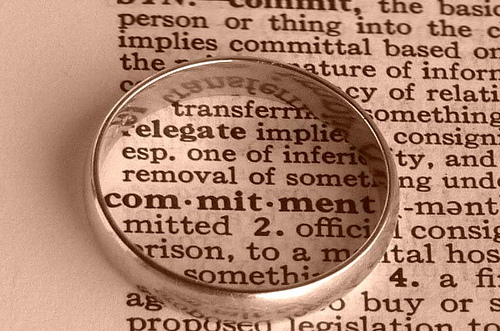 Today, the word commitment hast lost its meaning. It used to be something positive, and a committed person was someone to be admired; loyal and steady. A commitment now is something that we avoid. We don’t want to tie ourselves down. Take faith for instance. We don’t want to commit to Allah. We’ll take Allah when we need Him, or when things are going good. But real commitment? That requires staying power – in faith and in marriage. You know what; If we don’t commit, we’ll miss the happiness that we cannot find alone. What can I say here is everyone of us after this must having some pause, and just muhasabah about this one simple word, ‘committment’. (1) My friend’s dad tell him that ‘The difference between a boy and a man is a man takes responsibilites, but boy don’t’. So, choose. (2) Confident is the greatest reason why people attracted to us. And commitment is about having high confident. My marriage is just about 2 months old, I can’t really say much. I don’t really know what’s gonna happen tomorrow. Let’s pray to Allah it’s gonna be like a Bollywood movie – happy ending even we have to struggle before. Nevertheless, we always believe in one ayat of Allah from surah anNur ayat 32. During the preparation period, we wholeheartedly believe that Allah will help us, and Allah indeed helped us. Alhamdulillah. InshaAllah – next time if there is any demand – I will share with you all how having iman in this ayat invite rezeki of Allah dari arah yang tidak disangka-sangka. However, there are several spelling and grammar errors in your post, that I had to keep correcting while reading. Syukran, for the thoughtful post. Subhanallah, Isi menarik, cara penyampaian mudah di fahami. Cuma, there is some advice. Cuba guna justify untuk entry tu terletak elok ketepi. Dan nampak kemas. Kemudian, untuk tajuk sama ada guna garisan atau boldkan dengan warna yang berbeza selain hitam.